We moved into our own driveway today, to camp here while we get the house ready to sell. The renters were supposed to be out by today, but they aren't. There's still a lot to do, and I can see how they might feel overwhelmed. We're feeling it too. 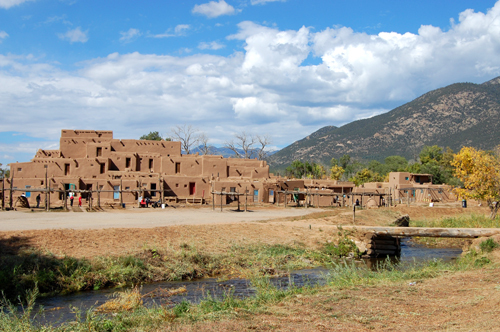 Once we took a look around and saw the amount of work there is to do, we got right back in the truck and headed for Taos Pueblo for San Geronimo Day. I'd love to show you pictures, but cameras aren't allowed. It would have been easy to fake a phone call and snap a few with my cell phone, but that just wouldn't be right, now would it? Here are a couple of pics I lifted from the internet. Entirely better juju to do it that way. 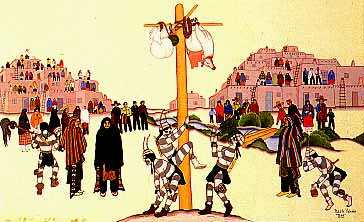 This is the Pueblo, which has been here for over 1,000 years. The area was jam packed with people today, all watching the antics of the sacred clowns. Finally, one (or this time two) of the clowns climbs to the top of the pole, to let what appears to be the symbolic fruits of the harvest down from the heights, and to sit on the very top of the pole. Rick's best guess is that the pole is 50-60 feet tall. And we think we remember a year where the clown actually stood on top of it. Pretty scary from the ground, and very amazing to watch. As with all Taos Pueblo feast days, the traditions and language are held secret, and it's considered very bad manners to ask questions. I wish I knew more, but there we are... I wish I knew more about a lot of things. Lately the List Of Stuff We Don't Get to Know is getting longer and longer. And tomorrow, oh, I don't know... I think we'll just stay out of the way and hope for the best.